A cool Wednesday evening—we finally have a break from the heat. 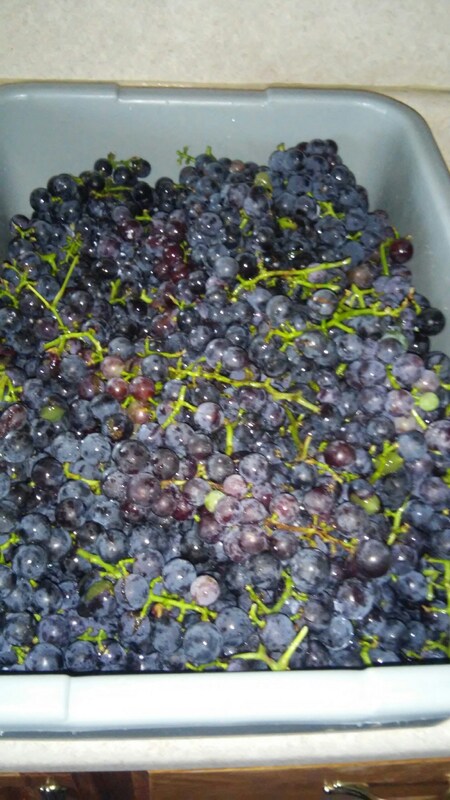 Tonight was a nice evening to go to the local u-pick for grapes. 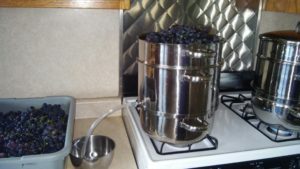 Tomorrow we will steam the grapes into juice. We make grape juice concentrate. Sugar and water can be added to suit your own taste when you open the jars. A good healthy drink on those cold winter mornings. The steamers have saved so much work. I have two of them so it keeps me busy to keep both filled and filling the jars. We also purchased apples and cider. Yum! Fresh apples and cider with popcorn makes a good snack! I will finish this tomorrow. Good night. Church services were held here with Mose and Susan hosting the services. That was round number three for church services being held here this summer. Along with hosting those and the family gathering, our house stayed extra clean and tidy. Now with that being over we can get out the sewing machines and start cutting out material for more wedding clothes. Yesterday, daughter Susan cut out her dress, cape, and apron for Mose’s sister Esther’s wedding. I’m to wear a dark blue dress and I have one already. But I need to cut out a dress for Loretta for next week. Her special friend Dustin’s brother Clint is getting married. Dustin and Loretta will be witnesses in the wedding. I was asked to cook so I will also go help with preparations for the wedding on Monday. Last week we had a nice but very hot day for the wedding of our neighbor girl Mary and LaVern. My job was to wash dishes, and wash dishes I did—all day! Needless to say my hands were very clean by night time. Mary wanted my sisters Verena, Susan, Emma and our daughters to yodel for the guests after everything was over (except for washing and packing up dishes for the wedding wagon). Yodeling is a Swiss tradition I was brought up with. In this community it isn’t so common. As children we would help along as my mother and her sisters yodeled and this began a new generation of yodelers. I was happy to meet some of my readers (relatives of LaVern) at the wedding. I am always glad when they come up and say hi. It gives me encouragement to go on even on busy days like today. 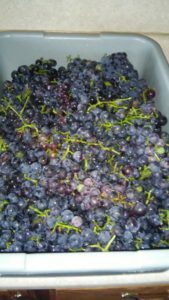 I am quickly writing this before tackling the grapes that are waiting to be made into juice. Daughter Elizabeth and her little Abigail came to help today. Laundry is being gathered to wash. I needed to go to the desk in my bedroom to finish this. Too many distractions; who could concentrate writing with sweet Abigail walking around? Chattering Abigail decided it’s faster to start walking instead of crawling. She is everywhere and Grandma’s house is again getting childproofed. She loves my cabinet with all my little Tupperware containers. Such a past-time she is and can very easily get this Grandma to neglect her work! Mose and Susan served chicken and noodle soup for their church lunch along with bologna, cheese spread, peanut butter spread, freezer and dill pickles, pickled red beets, homemade wheat and white bread, butter, strawberry jam, hot peppers, ice tea, coffee and a variety of cookies. We prepared four twelve-quart kettles of chicken and noodles. We added diced carrots and potatoes into the soup. That gives it a better flavor. There was a whole kettle left over so Susan passed it out to family. It made an easy lunch for the ones packing their lunch and also an easy supper Monday evening along with sandwiches. I will share the recipe for the chicken noodle soup that we used. It is probably way too big for most people to use but if you ever need a big amount to feed a crowd it might come in handy. Bring broth and chicken pieces to a boil in 12-quart kettle; stir in noodles. Add potato water, chicken soup base, other veggies, and salt. Return to a full boil and cook for several minutes, then turn off heat. Cover and let stand for 30 minutes. Note: Depending on the noodles you use, you may need to adjust the amount to only 3 pounds for a 12-quart kettle. Amish Chicken Noodle Soupgrapesjuice steamerLovina EicherLovina's Amish KitchenThe Essential Amish Cookbook: Everyday Recipes from Farm and Pantry.